Planning a Walt Disney World vacation can be overwhelming. Just getting started? Check out this post. Trying to think back to when I didn’t know as much about Disney as I do now, I think about what information I wished I had. With so many things to do, it can be hard to figure out what you should do, and what you could skip. While everyone has a slightly different view on things they need to see and could pass up, I thought I would put together a couple of lists for different people, to make your life a little easier. With that said, I would like to introduce the Not to Miss series. Over the next few weeks I will be adding posts to this series, so keep an eye out! I’ll go through the shows and attractions, the location, and any tips or tricks I’ve found when experiencing the show or attraction. First, I thought we would take a look at fun for little ones. Keeping in mind that Walt Disney World is targeted to families, this list is going to be fairly long. The majority of rides for smaller children are located at Magic Kingdom, so I started with that. Now let’s get onto the list! Astro Orbiter– this “Dumbo” style attraction takes place much higher, offering amazing views of Tomorrowland and all of Magic Kingdom. It’s fun day or night, but I personally wouldn’t wait more than 30 minutes in line for it, and I’m sure your little ones wouldn’t want to either! Use the Disney Parks app to check the wait times and ride accordingly. The Barnstormer– this kiddie coaster is located in Storybook Circus, and is a short but fun coaster for the kiddos. Depending on wait time, you may want to use Faspass+ for this one. Buzz Lightyear’s Space Ranger Spin– Enter Tomorrowland and help Buzz Lightyear defeat Emperor Zurg in this lazer shooting attraction. Spin your car and hit the targets! Kids will love to control the spinning car, and the blacklight scenes are so much fun! Fastpass+ is not needed for this attraction, but is available. Casey Jr Soak Station– Also is Storybook Circus is this splash pad. Great for a quick cool off or some play time on a hot day! Wait time is N/A. 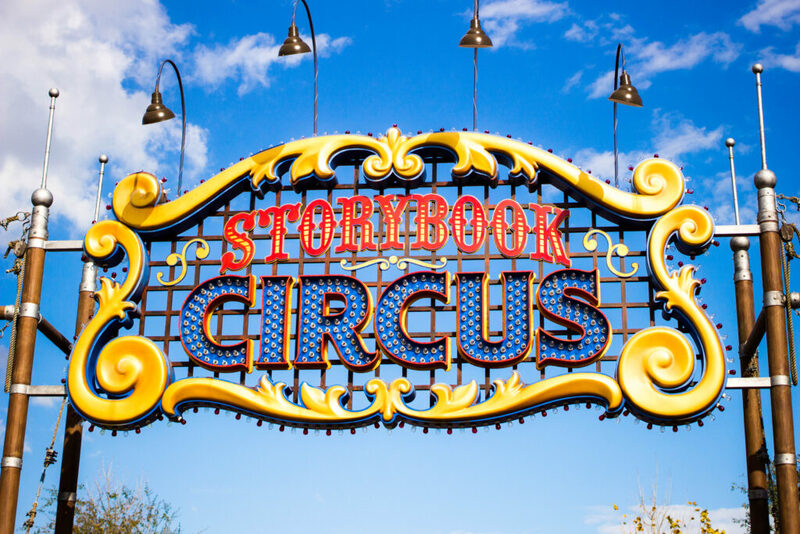 Dumbo the Flying Elephant – Dumbo is now located in Storybook Circus, and has doubled in size! For the little ones they even have a playground in line! You get a buzzer and are paged when it’s your time to ride! Fastpass+ is helpful, but not needed for this attraction. If you are travelling with kids who aren’t tall enough for bigger rides, I would suggest using Fastpass+. Other versions of this ride are all around Walt Disney World. The Magic Carpets of Aladdin is in Adventureland, There is also Tricera Top Spin at Animal Kingdom. If your little ones like Dumbo, they’ll probably want to ride all of the variations. The second newest land in Magic Kingdom is home to Dumbo! Enchanted Tales With Belle- Step into the story of when Belle and the Beast fell in love! Your kids can help tell the story, and they will love it! Enchanted Tales With Belle is available with Fastpass+, but from what I’ve seen the wait times aren’t too bad. Haunted Mansion- this classic takes a bit of a different spin on a haunted house. Ghosts dance and sway and come out to socialize. I was scared of this ride at 5, so keep that in mind for younger children. It’s A Small World- The song will most likely get stuck in your head, but the dolls are adorable and the scenes are beautiful. Little ones will love the “happiest cruise that ever sailed”. Jungle Cruise- Another classic that takes you on a cruise. Enjoy the jokes from the skipper, and say hello to Trader Sam. Fastpass+ is available, but you may want to use it on other attractions. Mad Tea Party- This is the classic spinning teacups ride! Located in New Fantasyland, your kids will want to spin until they get dizzy! The line can get pretty long for this one, and because it doesn’t load consistently (like Winnie the Pooh), I would suggest Fastpass+ if your kids are keen on riding. It’s not needed, but you can experience it in the morning or later at night with minimal wait. The Many Adventures of Winnie the Pooh- Enter the Hundred Acre Wood, bounce with Tigger and all of Pooh’s friends. My favourite scene is with the Heffalumps and Woozles! The line is generally pretty short. Mickey’s PhilharMagic- Join Donald Duck and the rest of the gang in a 3D film featuring your favourite characters. This one is really fun! Don’t forget to smell the pies in the Be Our Guest scene! Monsters Inc. Laugh Floor- Enter Monstropolis and help Mike and his friends power the city! A funny show that sometimes picks on audience members, but all in good fun! Peter Pan’s Flight- Probably the most popular ride in Magic Kingdom (or at least the one with the longest line), so Fastpass+ is a must if you want to ride. If you don’t want to use a Fastpass+, ride in the first hour of the day or later at night. Fly above London and Neverland in a ship! Pirates of the Caribbean- A classic that has small drops and lots of pirates! Can your little ones spot Captain Jack Sparrow? Prince Charming Regal Carrousel- Actually the oldest attraction is Magoc Kingdom, this carrousel features scenes from Cinderella above. 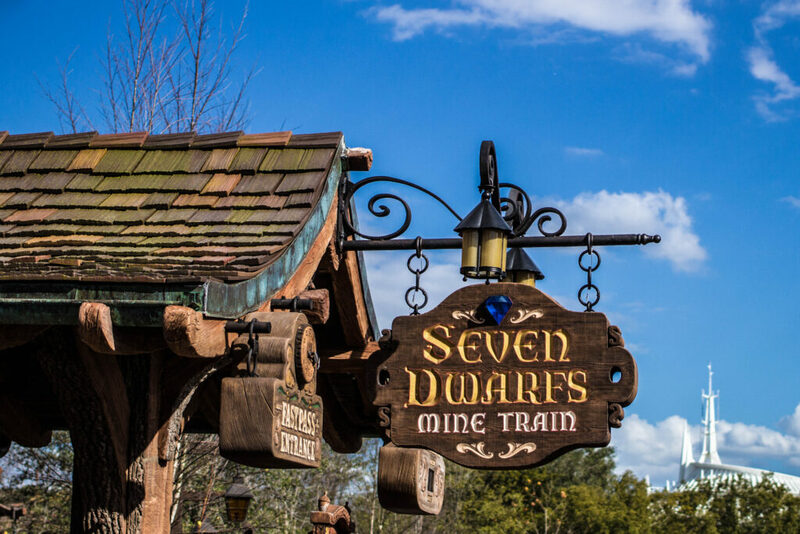 Seven Dwarf Mine Train- This is the newest ride to Magic Kingdom, and is a small coaster that feature your favourite seven dwarfs. Tomorrowland Speedway- This was my favourite attraction when I was 5, because I loved being in the drivers seat! Fastpass+ is available, but not needed. Tom Sawyer Island- Take a raft over to Tom Sawyer Island where your kids can play and explore. It’s a nice change of pace in the parks. 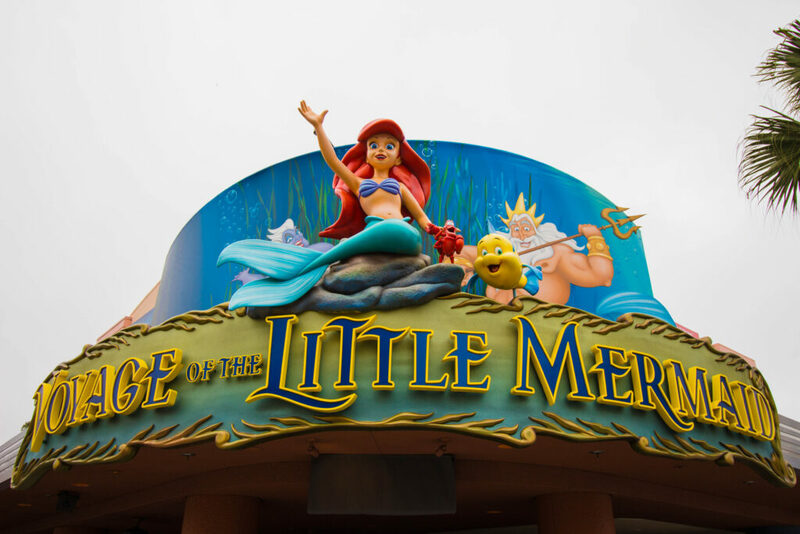 Under the Sea: Journey of The Little Mermaid- Journey under the sea with Ariel and friends! This is one of my favourites in Magic Kingdom, and makes use of some of the great technologies now available. Gran Fiesta Tour Starring The Three Caballeros- This boat ride inside the Mexico pavilion is really fun. You learn about Mexican culture with Donald, José, and Panchito! A nice ride to start or end your journey around World Showcase. Journey Into Imagination With Figment- The Imagination pavilion has tons of fun for kids, and your little ones will love this ride. After, play the interactive games! Kidcot Fun Stops- These stops are located all around World Showcase, and make it a little more fun for the kids. You can find the specific locations on a park map. The Seas with Nemo and Friends- In the big blue world… dive in with Nemo and friends and help find Nemo! The coolest part is, there are actual fish swimming too! Stop by Turtle Talk with Crush after and be all like “dude”. Soarin’- This is a fun one! Little ones will feel like they are flying! Fastpass+ this attraction, or ride in the first hour of park opening. Honey I Shrunk The Kids Movie Set Adventure- Less of an attraction and more of a playground, this one is fun! Just be warned, it can get very hot in there during the summer months! Muppet*Vision 3D- If you have Muppet fans in your party you won’t want to miss Muppet*Vision! I still see this every trip, and I loved it when I was a kid! 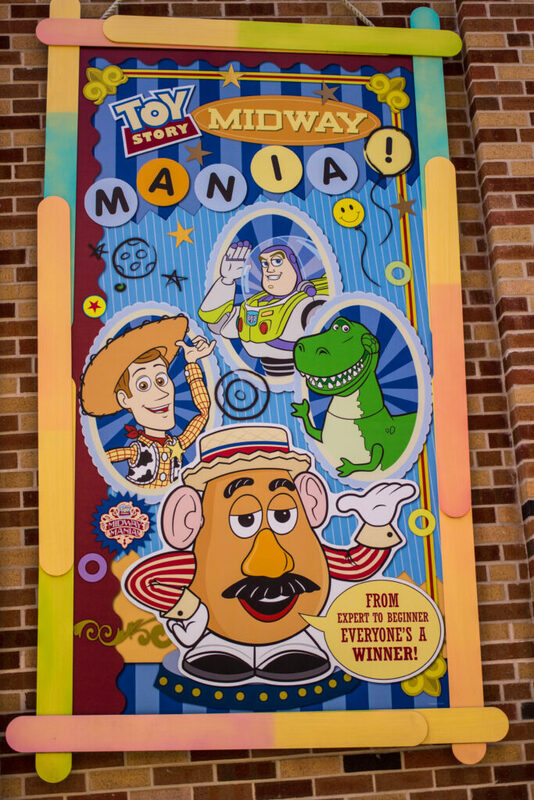 Toy Story Midway Mania- Fastpass+ this one for sure. Your little ones will love shooting the cannons and hitting the targets with Woody and the gang. Beauty and the Beast Live on Stage- This stage show is Broadway scale, and has all your favourite characters! Times are available in the Times guide when you enter the park. Disney Junior Live on Stage- If your kids watch Disney Junior they will love this stage show! Check showtimes when you enter the park and get there a little early. For The First Time in Forever: A Frozen Sing-along Celebration- Frozen fans will love this! Sing with Anna and Elsa, and people of Arendelle to your favourite Frozen songs. Fastpass+ is available, but seats are generally available for all showtimes. The Boneyard- This playground is fenced in so no kids can get out! With lots of seating for parents, it’s a nice break! Can your little ones find any bones? Get digging! It’s Tough to be a Bug!- Located under the Tree of Life this show features all of your favourite bugs! It’s also great to do to get a closer look at the Tree of Life. Hopper appears, and may be frightening for some children. Kali River Rapids- You will get wet on this one! Use Fastpass+ to experience it during the hottest time of the day! The raft ride is so much fun, and you never know who will get soaked! Kilimanjaro Safari- Definitely go on this after you’ve been on Jungle Cruise at Magic Kingdom, and see the real thing! 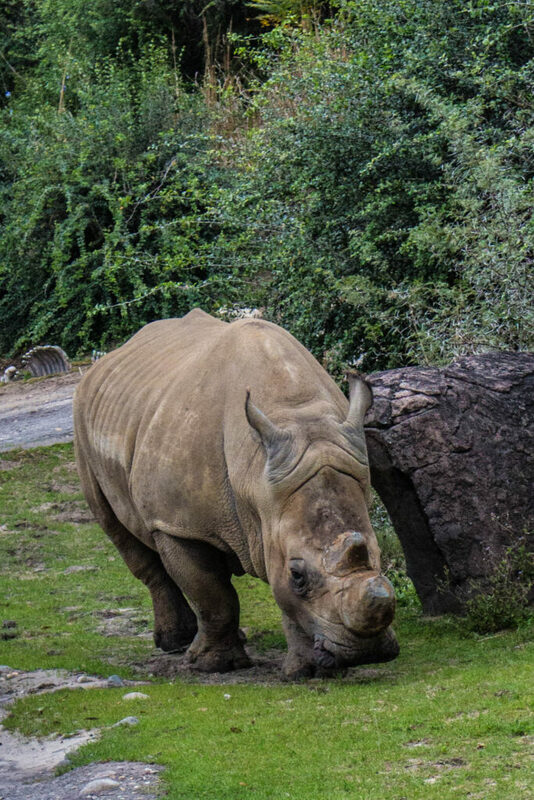 Head out on safari and spot lots of different animals! Use Fastpass+ for this one, or ride in the first hour of park opening. Wilderness Explorers- This is a fun activity for kids of all ages. With places all over the park, complete challenges to earn badges and become a Wilderness Explorer! Park maps will show all locations. This guy came up right beside the truck, you never know what you will see! I know this post is quite long, but thank you for sticking through it! Have you travelled with little ones? What are their favourites? Let me know in the comments! I also just wanted to take the time to say Happy Holidays, and thank you for sticking around on this adventure I started almost 6 months ago! It means so much to me to be able to share all of this with you!